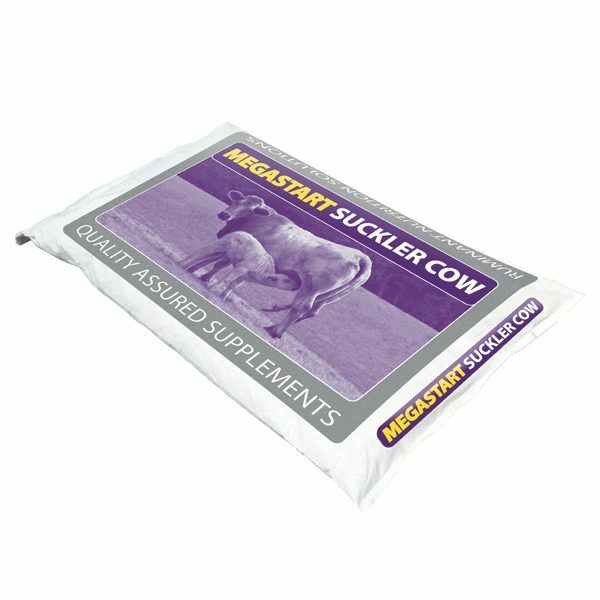 Megastart Suckler Cow is a powdered mineral specifically designed for suckler cows pre and post-calving, supplying all the necessary minerals and vitamins required for a healthy cow and calf. With a high level of magnesium, this mineral is suited to all year round supplementation. The weather proofing included makes it suitable to feed outdoors in a trough, top dressed, or included in a TMR. MOS is included to promote a healthy gut, with optimum levels of zinc and iodine included to aid the immune system response. High Vitamin E and selenium levels help to increase the quantity of colostrum, a vital factor in the early development of the calf’s immune system. The selenium level also helps combat typically low levels seen in UK forages. Specially formulated to provide suckler cows the minerals and vitamins they need pre and post-calving. Weather proofed for inside and outside feeding. Increases quantity of colostrum – vital in the early life of the calf. Contains MOS designed to promote gut health.